Elegant pendant with 11 stylish glass spheres. Pendant lengths will be set during production. Please let us know, how long the shortest (min 10cm) and longest (maximum 3m) pendant length should be. The tolerance to the ordered length can be + / - 5 cm. 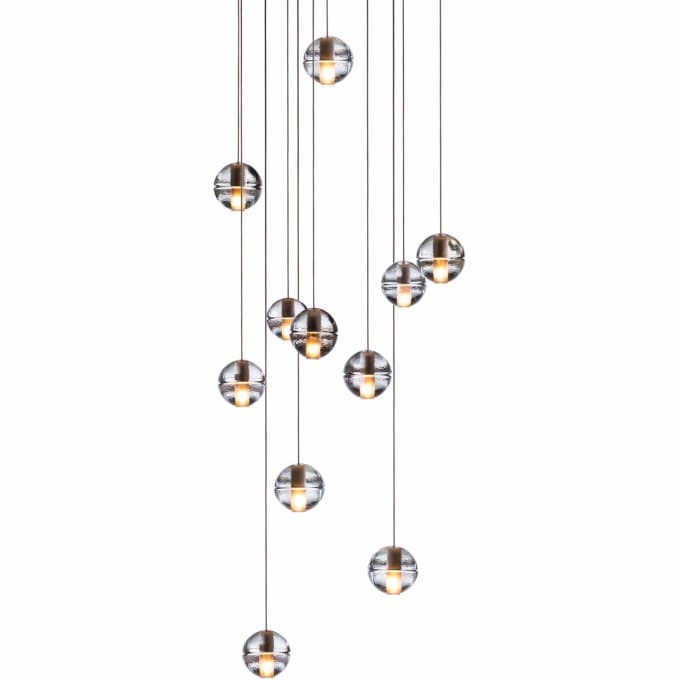 14.11 is a low-voltage cluster of 11 articulated, cast glass spheres with frosted cylindrical voids, each housing either a 10-watt xenon or 1.8-watt LED lamp. Pendant lengths are pre-set during production and are not site adjustable. Clients must specify the shortest and longest lengths when ordering. The pendants come standard with 10' / 3 m of coaxial cable. Additional cable lengths are available in increments of 10' / 3 m, up to a maximum of 120' / 36 m in special applications. Popular residential and commercial applications include clusters over tables in dining rooms and restaurants, accessory lighting in living rooms and baths, linear configurations over bars and kitchen islands, large clusters in foyers and lobbies in both private and public spaces, as well as single pendants as points of interest. In 2005, Bocci was founded in a red barn surrounded by hay fields, on the periphery of Vancouver, Canada. The company launched with one product, 14, which became an instant classic and remains a design staple and bestseller. Bocci has a growing portfolio of contemporary design ranging from light installations through to furniture and electrical sockets. All Bocci designs are developed, engineered, and fabricated in-house through an infrastructure calibrated to provide full control over technique, quality, and scale. Do you have a question about "14.11"? How can we contact you?